Pilates or yoga? 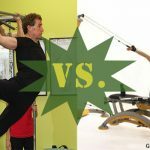 Which is better to choose for your workout? Both have been touted for their ability to create long, strong and supple bodies. Both can be vigorous or mild, depending on the instructor and discipline of the practitioner. Both can even use seemingly strange equipment. So what’s the real difference between Pilates and your general yoga class? Yoga has been around for thousands of years, but it is worth noting that it originally began as a practice designed to prepare for seated meditation. And while yoga today is more commonly associated with women practitioners, the ancient yogis and the postures were designed for men. Pilates, meanwhile, was developed by Joseph Pilates during World War I as a way to help prisoners be healthy and strong. He wrote his first book on Pilates in 1934. 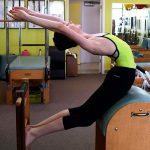 The Pilates method we know today is directly descended from Joseph Pilates. The similarities between Yoga and Pilates are extensive. Both modalities help relieve chronic back pain in the appropriate class. Neither a group mat Pilates class or a heated vinyasa flow class, however, would be the right fit for someone with back pain. Back pain students are recommended for private sessions (such as the one on one appointments at Dynamic Fitness), restorative yoga, or alignment-specific group classes. Pilates and Yoga both work to improve stability and increase overall balance–especially in elderly populations, those returning to fitness following an injury or surgery and even in athletes. How you breathe is just as important as the physical form in both Pilates and Yoga. In Pilates, students will generally practice the same, coordinated deep breathing throughout the forms and exercises. Yoga emphasizes breath throughout the movement, but will also focus specifically on various breathwork in a form called pranayama. Yoga’s initial purpose was to bring the individual to a place where the mind slows and enters the clarity of the present moment. Pilates, similarly, promotes mindfulness throughout the entire form, encouraging awareness and presence in each posture and movement. Both alignment-based yoga (such as Iyengar) and Pilates rely upon the use of various props and apparatuses. In yoga, you may use a block, bolster, sandbags, wall, strap, or more. A dedicated Pilates studio can feature a reformer, table, chair, ring, ball, and more. Yoga generally uses the props to make a pose more accessible, whereas Pilates uses the Props to ensure proper form and stronger performance. Yes, both Pilates and Yoga are highly dependent on the teacher and studio for the experience. The quality of classes varies greatly from gym to studio to private sessions. In both Yoga and Pilates, it’s recommended that students study from a teacher with an extensive background and an understanding of anatomy. If you have any medical conditions, make sure to talk to your doctor and find the right fit and program for your needs. While yoga touches upon core work (especially in today’s crowded “power” and heated flow classes), the majority of classes miss out on concentrated toning and focus on the abdominal center. Pilates includes focus on precise movement and the entire center of the body, providing greater core stability, fitness and more. Many yoga classes will incorporate these elements, but they will not be the entire focus of the practice. Many yoga classes include an emphasis on spirituality, including mantra meditation, chanting, and more. While Pilates enhances relaxation and mindfulness, it is a non-dogmatic approach to physical fitness. Pilates encourages stronger and taller posture, focusing on postural correction and alignment. Today’s vinyasa, flow, and power yoga classes tend to increase the forward position of the shoulders due to the repetitive nature of the plank posture and chaturanga/lower push-up position. Both Pilates and Yoga are wonderful physical and mindfulness practices to increase overall health and wellbeing. It’s important to do research to find the class, teacher or studio environment that best meets your needs. The two are also a wonderful combination–especially when combining Pilates for strength and agility and Yoga for relaxation and restoration. If you currently study Yoga or Pilates, talk to your teacher to find how to best blend the two. When practiced together, the body becomes even stronger, the mind even sharper, and the body becomes easier to inhabit for all aspects of life. Please don’t hesitate to reach out if you have any questions about our Pilates classes, rates, or scheduling. You can also follow us on Facebook. Thanks!